Yesterday my son was playing outside in the backyard. He was playing with his tractors, dump trucks, and various digging equipment. He was very content playing with his toys, so I took advantage of this time to do some housework. I kept checking on him and all seemed to be fine. 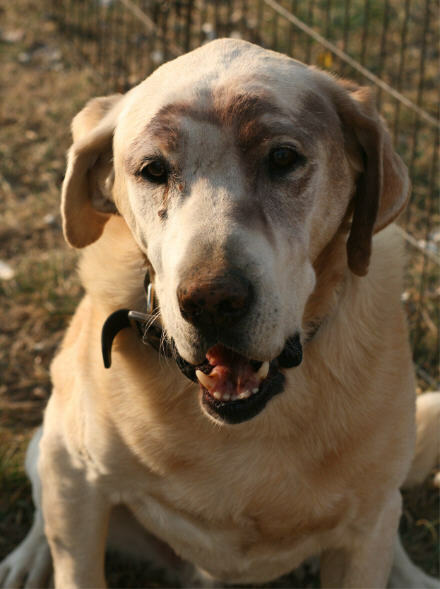 Major, our old lab, was out doing his thing – which at 13 years old is a lot of sleeping. I asked my son what happened to Major??? He said that he fell in the dirt. This was some what believable because he isn’t very steady on his feet and has been falling more and more lately. There is some fresh dirt in the backyard because my husband ground a huge stump back there this last weekend. I thought there was probably more to the story but didn’t see the point in pressing the matter. When my husband got home he also asked our son what happened to Major. We thought he might come out with the truth if asked again…he did and we both had to leave the room because we started laughing. I would have loved to see how he did this – Major may be old but he isn’t small and he is still strong. I don’t know if he did it while he was sleeping??? Poor old man is now sporting a camoflauge mask. The cans of spray paint are now on one of the top shelves in the garage! This was posted to one of the Yahoo e-mail groups I’m a member of, it was found on Craigslist – it sure brought a smile to my face – Enjoy! pecking themselves until they all moon me as soon as I walk in the door. Don’t get me wrong — these are good layers. All large breeds. no bugs (they’d be easy to see). and maybe that’s where I went wrong. So here’s my plan: I’m disbanding the government. weeks until the feathers grow back in. Because I know it will work. every rooster that I’ve never been able to get rid of on Craig’s List. So why don’t I just set all the chickens loose? to $14 each right now, and I’m giving a dented-can discount). pay me $7 each for them (I’ve tried). If you don’t, it’s OK. I have a fall back plan: I’ll schedule a tribunal. I’ll have him hitting home runs by the time we’re through. Fred stays. She’s earned her roost, if I can ever catch her.